The trek begins at the southern end of McPhails Trail, at its junction with Jacks Corner Road, 7.5 km west of the Kangaroo Valley Township. Jacks Corner Rd is an extension of Bendeela Rd which runs off Moss Vale Rd 0.5 km west of the Kangaroo Valley Bridge. Parking is available in the paddock immediately to the east of McPhails Trail. The first kilometre of this section is through private property and then mainly through Morton National Park with a short section of land managed by the Sydney Catchment Authority. McPhails Trail traverses beautiful moist tall eucalypt forest with small patches of rainforest. Sydney Blue Gum, Yellow Stringybark, Grey Ironbark, Turpentine, Mountain Grey Gum, White-topped Box and Brown Barrel form the tall canopy, while Lilly Pilly, Cabbage Palm and Sassafras are common trees in the rainforest. The occasional Red Cedar can be seen. Leeches may be present if the ground is damp. Initially the trail climbs 300 metres over a distance of 2 km and includes a short steep section 100 metres from the start. With the south east corner of Mt Carrialoo appearing to your left the trail levels out and follows a generally flat gradient for 1 km before descending for ½ km to a saddle with a small clearing. Trees may be across the track in places and short diversions into the adjacent forest will be needed. These are generally obvious. The small clearing is a remnant of McPhails farm. The track then proceeds east, gradually ascending along the edge of a major tributary of Yarrunga Creek. There are some very large and impressive trees along this section. After 2 km the trail meets a Sydney Catchment Authority Road which is followed in a northerly direction for 1.5 km until the Fitzroy Canal is reached. At this point some volunteers will direct you for 250 metres across a wide fire break and up a short section of rockwall to the road which follows the western side of the canal. Here the forest is a dry sclerophyll forest and woodland due to the sandstone soils and the main trees are Scribbly Gum, Silvertop Ash and Sydney Peppermint. After about 2.5 km at a gate close to the Moss Vale Road, turn left along a fire trail to the southern end of the East Rim Walk. This takes you through to Fitzroy Falls. This is a delightful walk through heathland, woodland, and tall Brown Barrel Forest with many tree ferns closer to Fitzroy Falls. It includes steps and has several lookouts over the beautiful Yarrunga Creek Valley.. As you approach Fitzroy Falls the walk passes under a road bridge over Yarrunga Creek where it joins the West Rim walk. Turn right at this junction to the first check point and the finish for some walkers. The checkpoint is just past the Visitor Centre and to the right at the eastern end of a large shelter. There are toilets here and food and drink are available at the café. Please note that apart from the Link Fire Trail, vehicles could be encountered from the Red Hill Trail to Meryla Pass, and walkers should walk facing oncoming traffic and be aware of and give way to vehicles. Continuing from here, proceed along the West Rim walk past the main Fitzroy Falls Lookout. This is also a delightful 2 km walking track through Morton National Park with views of Fitzroy Falls and the Yarrunga Creek Valley. There are steps in places and it includes two creek crossings one of which is above Twin Falls. Just before Starkeys Lookout proceed west to meet the Red Hill Trail. This trail follows fairly level terrain for 3 km to its junction with Red Hills Road where the Trek turns right. After following Red Hills Rd north for 500 metres, turn left onto Gunrock Creek Fire Trail. You are now walking in Meryla State Forest. After 1.5 km along this trail, a marked intersection will direct you along the Link Fire Trail which is now a foot path for a kilometre before it joins the Meryla Fire Trail. 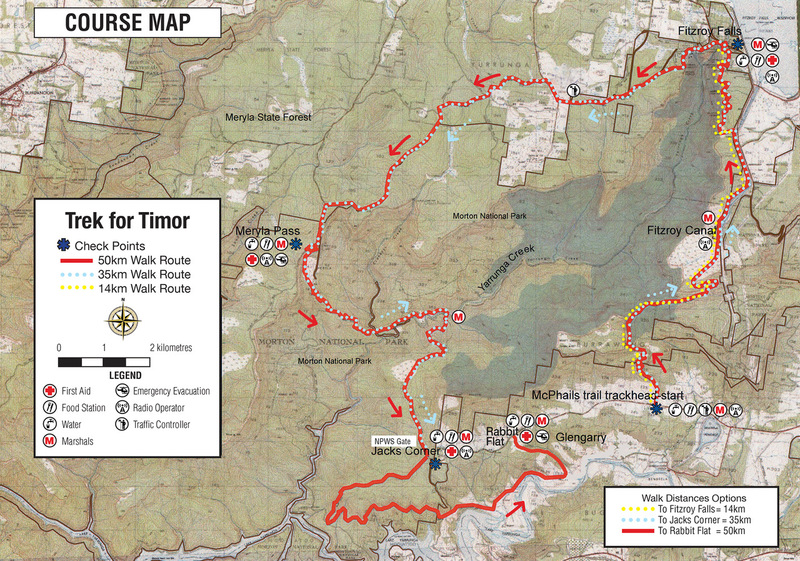 Follow this trail over level terrain for 4 km to its junction with Meryla Road and Wombat Hill Lookout Trail. Turn left on to the latter and follow it for a kilometre into Morton National Park again and on to Meryla Pass which is the next checkpoint. This section passes through dry sclerophyll forest and woodland on a plateau of Hawkesbury Sandstone and the understorey has a great variety of shrubs and sedges, many of which may be in flower, including leptospermums, patersonias, isopogons, epacrids, hakeas, persoonias and lambertia. At Yarrunga Creek a rope will be strung across the creek to assist walkers to cross the creek. At least 2 volunteers will be stationed at the creek crossing. There are a series of stepping stones which may be partly submerged if the water level has risen due to rain. If the levels are considered too high for safe crossing or if forecast rain indicates a possible sudden rise in levels, a decision will have been made before the commencement of the walk, to terminate the Trek at Meryla Pass and for walkers to return to Fitzroy Falls. On the walk down from Meryla Pass walkers are advised to find some suitable sticks about 1.5 metres in length to assist with the creek crossing. From Yarrunga Creek the walk climbs an altitude of 200 metres over 4 km, and through one gate, to Jacks Corner at the junction of Griffins Fire Trail and Beehive Fire Trail. There is a checkpoint here and mobile phone reception a little further on at the junction of Griffins FireTrail and Jacks Corner Road. This stretch of walk passes through drier forest but with a variety of eucalypts including Grey Gum, White Stringybark, Scribbly Gum and Large fruited Red Mahogany. Paperbark Melaleucas occur in the drainage lines. Impressive rock outcrops of Nowra Sandstone occur about 1.5 km from Yarrunga Creek, and rock orchids (Dendrobium speciosum) may be in flower. This final 11 km section of the Trek initially follows Beehive Fire Trail in a westerly direction for 2 km along a gently undulating ridge. It then veers to the south and begins a 0.75 km descent as a walking track, which in places is quite steep and partly eroded. This track emerges at a junction of two roads. Take the road to the immediate left . This is Beehive Point Access trail and together with Jacks Corner Road, is a public road so walk facing oncoming traffic and be aware of and give way to vehicles. Follow this road for about 3.5 km along relatively level terrain, avoiding any track to the right. Soon after you exit Morton National Park you will meet Jacks Corner Road. Turn left and follow this road for 100 metres to another road junction. Turn right onto this road managed by the Sydney Catchment Authority. You now begin a 4.5 km section of track on fairly level terrain (apart from an initial descent) through some private property. Two closed gates are easily passed by climbing through railing on the first and a gap on the southern side of the second. A third open gate is passed after about 3 km. There are several tracks off to the left and right but the main route will be marked. As you have been walking along the lake side you will have noticed the intrusion of weeds such as wild tabacco and agapanthus in areas which were formerly grazing land now reserved for water catchment. When you reach a large shed on your left ( Glengarry shed) you will take a left turn up the slope toward a firetrail that veers slightly left and this is your last short uphill stretch before you reach the finish. You will notice that you now return to more natural dry sclerophyl vegetation- the turpentines, grey gums, bloodwoods, some ironbarks and in the understory, burrawangs (ancient cicads) and persoonias dominate this part of the trail. This is lyrebird habitat so you may hear them singing and scratching in the leaf litter floor. There are some loose stones underfoot on the steeper section so be sure to keep your balance. The great gift of this short uphill climb lies in the last 100 metres or so. If you are there before daylight fades you will walk through a corridor of large sandstone rocks covered in mosses, ferns and orchids. A place of peace and magic. When you emerge from this area you come to the last gate out of Glengarry and arrive at “Rabbit Flat” and a welcome worthy of your great achievement.